We are thrilled to feature an article by Young Beekeeper Award Winner Leo Schirokauer about his journey as a pollinator. Read all about Leo’s passion for bees HERE. 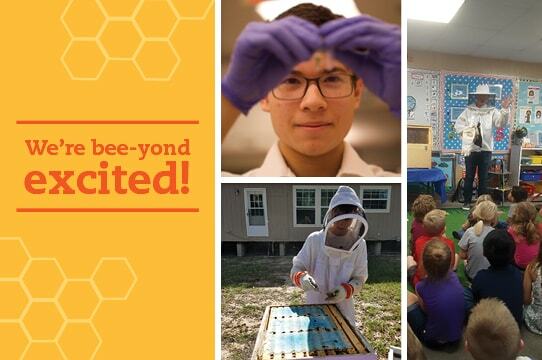 We’re bee-yond excited to announce our 2018 Young Beekeeper Award winners. Leo Schirokauer, Daniel McSween and Jonathan Murphy. We thank you for your and outstanding commitment to pollinator health. To read more about their projects click here. 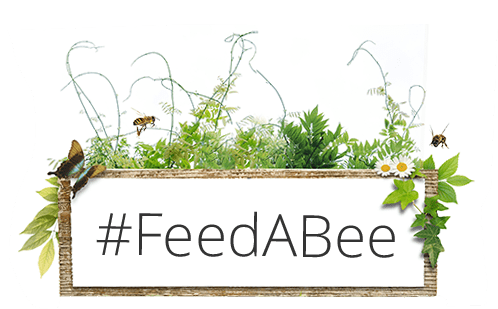 Help us #FeedABee by using the hashtag to spread awareness, or planting your own pollinator-attractants! If you are interested in establishing a large plot (minimum of 1 acre) of pollinator forage, click here. This summer, I was thrilled and honored to receive the 2018 Bayer Young Beekeeper Award. I have been passionate about honey bee health since I started with my first hive at 11 years old. In fifth grade, my librarian, who was also a beekeeper, showed her hive to my class. I was captivated, and the next year I entered and won an essay contest hosted by the Lorain County Beekeeping Association, receiving my first hive as a prize. 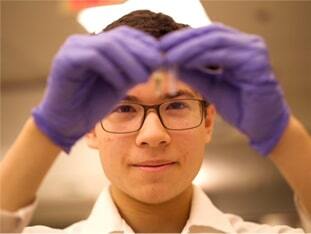 Fast forward six years, and I’m now taking my passion a step further by researching ways to improve honey bee health. Today, I believe microbiology may hold the solutions to many of the problems currently facing honey bees, and I plan to attend college next fall to study how we can harness the power of bacteria to solve many challenges facing the beekeeping and agricultural industries. I look forward to an exciting and productive year working with the Bayer Bee Care Program to support pollinator health as a Young Beekeeper Award winner. With the support of Bayer, I am working to develop a cure for the devastating honey bee disease American Foulbrood (AFB). AFB is an incurable disease that kills a hive’s larvae, ultimately killing the hive itself. In fact, the current recommendation is that all infected hives be destroyed, usually by burning. That’s why I am working in a lab at the Case Western Reserve University School of Medicine to find ways to treat AFB using natural honey bee probiotic bacteria. My treatment is based on genetically engineering a bacterium that naturally inhabits the honey bee gut to kill the AFB pathogen. This approach would allow for a one-time treatment that could protect a hive from AFB for the rest of its lifetime. The availability of a treatment for AFB would not only allow beekeepers to save infected hives but would also alleviate the growing danger of a larger scale outbreak of the disease. I’m really excited about the potential implications my research could have on the beekeeping industry and on pollinator health overall. This past June, I was recognized as the first-place winner of the Bayer Bee Care Program’s Young Beekeeper Award, which included a $3,000 prize. The award will be key to developing this AFB treatment and will support my plans to continue researching honey bee health in college. I applied for the award hoping to obtain funding that would allow me to realize my goals to help honey bees. I look forward to using a portion of the prize money to purchase the equipment needed to develop my treatment for American Foulbrood, and the remaining funds will go toward my college tuition. Since winning the award, my lab work has been steadily progressing. So far, the data I have collected looks promising. As mentioned, my main goal as a recipient of the award is to develop an effective and commercially viable treatment for American Foulbrood, which will be beneficial to honey bees and the beekeepers who manage them. However, it is also my hope that the methods I am using— engineering a honey bee gut symbiont to deliver an effector molecule—can be applied more generally to treat other honey bee diseases. Because, as we know, honey bees are a key “ingredient” in the inner workings of the agriculture industry, and we must continue to make their health a priority. If you want to hear more about the work I’m doing to develop a cure for AFB, you can check out the “Next Generation of Beekeeping” webinar, where I presented my research alongside the other two Young Beekeeper Award winners.